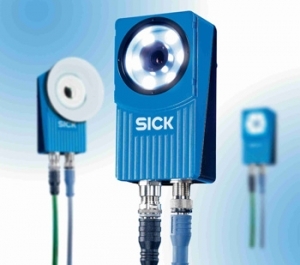 A new Inspector I40 2D vision sensor from Sick inspects products faster, with better definition, higher reliability detection and wider fields of view while remaining outstanding value for money. Compared with the earlier models, the new I40 offers improved data and image logging with ease of use for a wide range of product, quality and labelling applications including packaging, small parts assembly and electronics production. David Hannaby, vision systems product manager for Sick UK, comments: "Smart camera performance level inspection capability is achieved for the new Inspector I40 by building on the best features of the Inspector I10 and I20 models. For example, the higher VGA resolution, image capture speeds up to 250Hz, the additional pattern match tool, more detailed results information and image storage allow us to solve many applications where previously we would have needed a smart camera. "The benefit to the customer is lower-cost solutions that are easy to maintain on the production line; the wider field of view can mean less sensors are required. The I40 does not replace a 2D camera as many more applications require a greater degree of inspection and integration into the production process." The powerful Inspector devices are said to be as easy-to-use as a standard photoelectric sensors, yet they come complete with a choice of integral lighting, in-situ interchange filters and lenses, fast high-capacity processing, Ethernet comms and rugged industrial IP67-protected metal housings. Hannaby continues: "Robust small detail differentiation is available from the I40 even at high speeds with the integral pattern inspection tool. The choice of clear, red, green or blue lens ensures optimum detection for different product/colour combinations and the unique dome light helps eliminate error-inducing glossy surface reflections. "Product traceability and quality inspection are enhanced by the greater image handling and storage capacities. While the I40 can buffer up to 30 images, it also downloads images via FTP, for unlimited capacity. Use of Ethernet/IP also facilitates PLC control and SCADA network integration." The Inspector I40 can be rapidly reconfigured to suit changing application needs. Users can exchange lenses to meet requirements for a wider field of view or for inspecting smaller objects at up to 1000mm, with corresponding variations in field of view between 550mm and 150mm. An excellent resolution is retained at high speed for accuracy and rapid image processing. In addition, the Inspector I40 offers extended I/O functionality, enabling selection of up to 32 reference objects for comparison with the object being inspected, and delivering up to 30 inspection results at once. It also facilitates rapid reconfiguring between different products and part types in a large manufacturing unit. Individual items do not require identical positioning for inspection, as the software evaluates edges, contours, contrasts, grey scale values or pixels relative to a defined location feature in the reference image. The I40 can be used with or without a part presence trigger. Image capture and evaluation of multiple references occur as soon as an object enters the field of vision, without a trigger signal and thus reducing non-capture errors.